1. Click on the gear icon on the upper right corner of the screen to open the settings sidebar, then click on 'start form' to open the start form settings. 2. Scroll down your start form settings until you find the ‘advanced options’, click on the checkbox next to 'email inbox' to enable it. 4. All you have to do now is match the information in the email to your pipe's start form fields. After you’re done with matching your fields, just save it and you’re be good to go. Each of your pipes comes with a unique email address to which emails must be sent to create cards. If you wish to use your custom domain address though, it won’t be a problem. All you have to do is set it up to redirect the emails to the pipe's address. Most email services out there offer you the option to forward emails to another address. 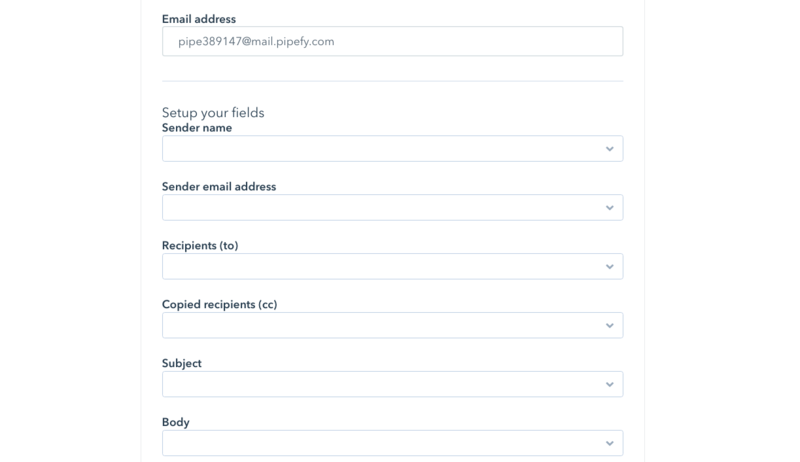 All you need to do is create an account with the address you wish (such as address@yourdomain.com) and setup all incoming e-mails to be forwarded to the e-mail address Pipefy provides you.